Meet The Doctor | Roseville, CA | Teresa Hall, D.D.S. Dr. Hall began her dental career as a Resident of Rancho Los Amigos Medical Center after receiving her Doctor of Dental Surgery degree from Loyola University School of Dentistry. She began her own practice serving patients in Roseville. A member of the Army Reserve, she was called to duty in 2003 and served with the 328th Combat Support Hospital in Kosovo. She was forced to sell her practice at that time and upon her return from duty, Dr. Hall continued her dental career as an associate in practices in and around Roseville. 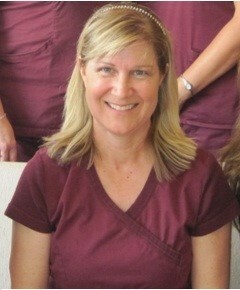 She made a decision in 2006 to again practice from her own office in Roseville with the forming of Waikiki Dental. Naming it for the love she, and her family, have for the Hawaiian Island of Oahu, Dr. Hall and her staff have created a very warm and relaxing atmosphere in which to offer dental care. In January of 2009, she was again called to duty to serve with the 360th Medical Company in Iraq. This time Dr. Bradley Smith (retired) managed her practice and took care of her patients while she was gone. She is deeply grateful for his kind and gentle manner and for the excellent care and compassion he gave to every patient. You can read about Dr. Smith and his selfless service in the archives of the Sacramento Bee. Being a veteran, Dr. Hall sincerely welcomes veterans and offers a substantial savings to veterans without insurance. As a wife and mother of three children, Dr. Hall is keenly aware of the importance of good general health for all family members. She is especially concerned for the part that oral health plays in the overall health of her patients to whom she extends a special welcome as warm as the Tropics.